The owner of the Fury 280 Hardtop had just taken delivery of it, and was towing it to Shark Bay soon after he had got rid of me. Buyers of Furys seem to be like that: time not spent using their boats is time wasted. And they all have very clear ideas of how their boats should be fitted-out and equipped. 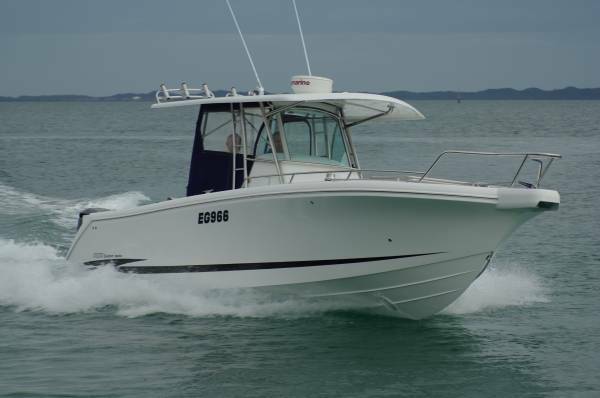 The builder’s full name is Fury Custom Boats, and custom built describes every boat that has ever left the factory. 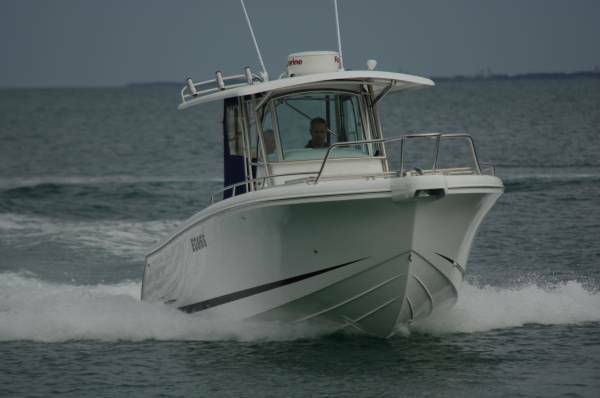 This one is the first hardtop, centre console Fury, and has a special feature specified by the owner: the canopy supports are carried on the console instead of the coaming, allowing a fishing rod to be used non-stop around the rail’s perimeter. And the rails themselves were lowered to make the fishing easier. 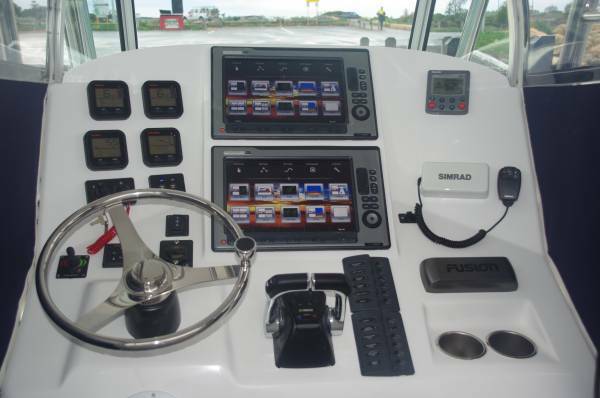 The console is big enough to qualify as a cabin, and the space under the hardtop can be virtually a wheelhouse. It has a solid wrap-around; the rear of the seating fills half the vertical space there, and clears with zip-open doors can enclose any openings left. It is as well that the console is wide – it has to carry an impressive area of electronics, engine monitors and assorted controls. 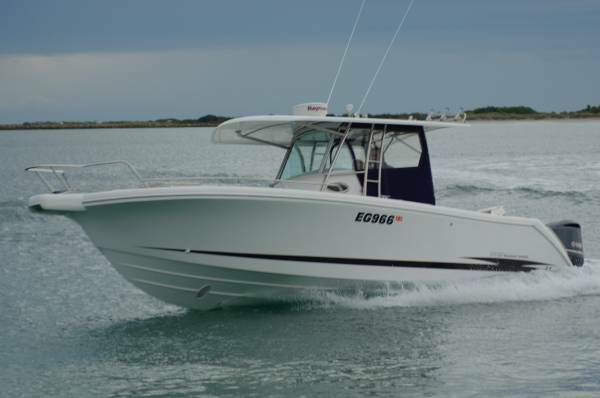 A pair of 14-inch Raymarine touch screens displays the information from radar GPS and sounder; for those long passages an autopilot takes over the tedious work. An unusual fitting on this size of boat is a bow thruster, whose control is convenient to the left hand leaving the right for the throttles. A thruster is not only handy when parking in a cross wind: it is just as useful when rounding up on a cray pot. Once having gaffed the float two other items ahead of the console come into play: a pot winch and removable pot tipper. Fishing is clearly the passion of this owner, and of a lot of other Fury owners. 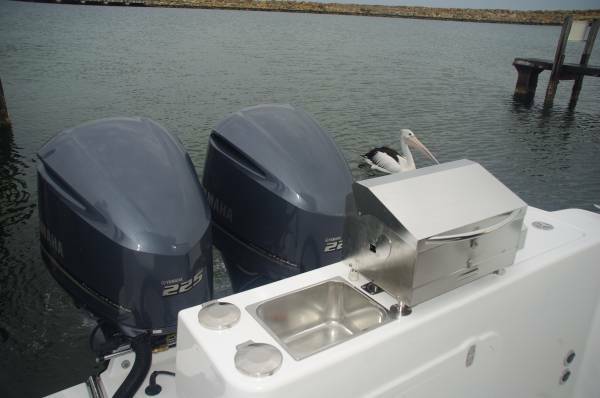 With abundant accommodation for rods, a pair of 120L catch tanks, live bait tank and masses of space the 280 is well set up to satisfy the passion. But many owners also use their boats as river cruisers with big bunches of guests, and overnight with another couple aboard. That console houses a toilet with lots of head and elbow room, and under the foredeck ahead of it is a double bed. The foredeck seating converts into another bed, and the foredeck itself becomes another cabin: a framed canopy, normally furled at the bow, extends back to the hardtop. For the daytime cruising role, the 280 can come up with surprising numbers of seats besides providing room for folding chairs of bean bags. The foredeck has a settee at the bow, facing another at the console’s front; a table drops into a socket between them. On the after deck a double unfolds from the thickness of the wheelhouse’s rear. Other civilized outdoor fittings are a barbecue and sink, and a hot and cold shower fed by a 100L tank. One of the most outstanding features though is an integral part of the structure: the thickness of the full length of the bulwarks has been converted into a dozen lockers, with only the stereo speakers taking a little space away from them. This gives storage volume unheard of in other centre consoles. 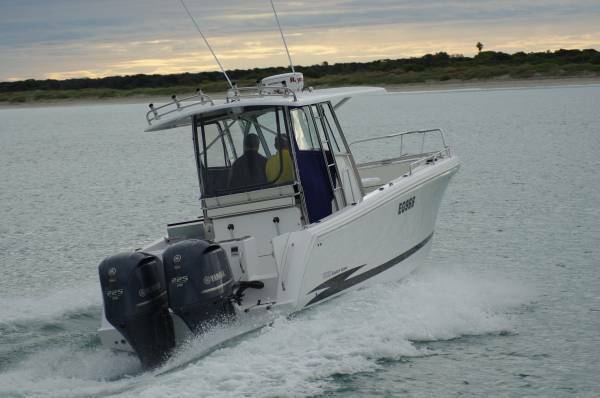 This is the fastest Fury yet: 47 knots from its twin 225hp Yamaha four-strokes. The owner would have been happy with the speed available from a pair of 200s but, with all-up weight being a consideration, the 32kg saved by going bigger was worthwhile. This curiosity is a result of the 225’s newer design: despite its 4.2L against 3.4L, the technology used to line its bores shaves away kilos. As well as saving weight, of course, its extra cubes give devastating acceleration. Under way the 280 is a happy blend of solidity and agility. The boat’s motion and the feedback to the driver suggest a larger boat – nothing flighty or twitchy here. Yet response to wheel and throttle is as instantaneous and crisp as you could wish. It’s a quiet boat too, partly due to the foam-filled hull – a desirable safety feature that is not compulsory on a boat this big. As well as twin starting batteries, the 280 has a separate house battery. They are tied into a wiring harness as well designed and executed as any I have seen. The boat has big-draw items distant from the batteries - the pot winch and the anchor windlass – and needs the low resistance cabling. The Fury sits on an aluminium trailer, massive yet holding towing weight down to what a Land Cruiser can cope with. The owner has the minor towing restrictions due to a 2.7m beam, but these are well compensated with the stability the extra centimeters bring. I envied the man towing it away.